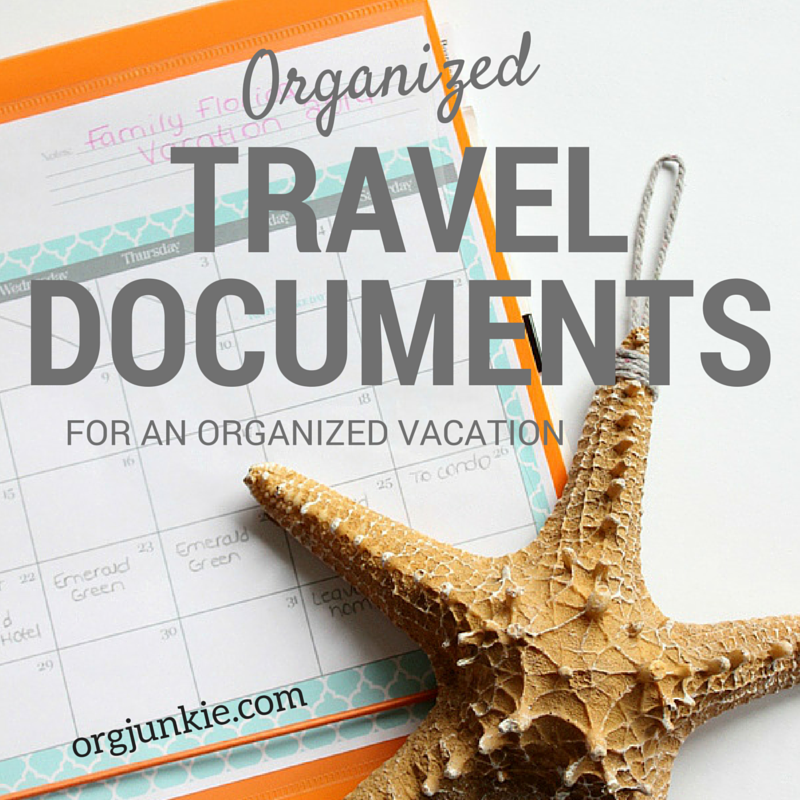 Keep reading to see how I organize our travel documents for a fun yet organized vacation. Please note that I may get commissions for purchases made through affiliate links in this post. Who doesn’t love a good vacation every once and awhile? I know I do especially if it involves hot weather, white sand, blue skies and the beautiful ocean. Since we live in Alberta, Canada, getting to the beautiful seaside usually takes a bit of travel. And with travel, especially in my world, comes chaos and unpredictably. Not such a great combination for this lover of all things orderly and calm. However the lure of the ocean is strong and I know all the upheaval of travel is so worth it once I walk over the bridge and glimpse a glorious view like this one. The beach is definitely my happy place! 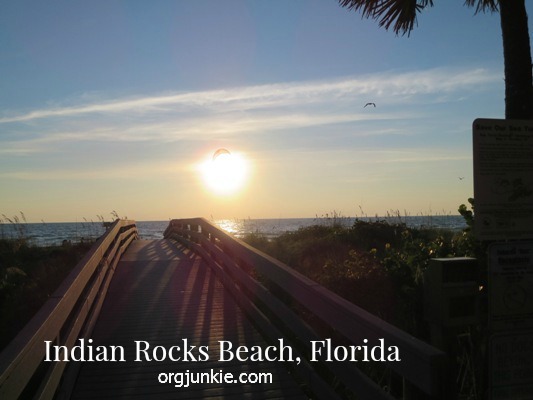 Over the years my husband and I have been fortunate to get away to the beach a couple of times just the two of us and then a couple of years ago we took the whole family to Florida for a week. So knowing ahead of time that I don’t handle chaos welI (we have had some crazy things happen to us when we travel!) I make sure I go into the adventure as organized as I possibly can. To do that I created a simple vacation planner portfolio using a pocket organizer with elastic closure (affiliate link). I’ve used this system for years and still use it to this day. Having all our vacation information in one place cuts down on all sorts of panic and stress. Also I prefer having printed copies of everything because I don’t trust WIFI to be available when we are traveling. I like having printed copies but if you are someone who prefers digital, I’ve got help for you below. 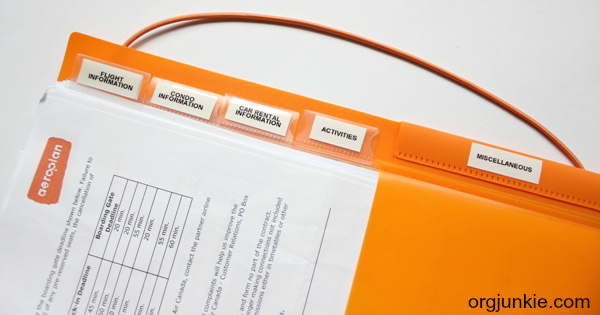 Tabbed sections include flight information, hotel information, condo information, car rental information, activities and miscellaneous. 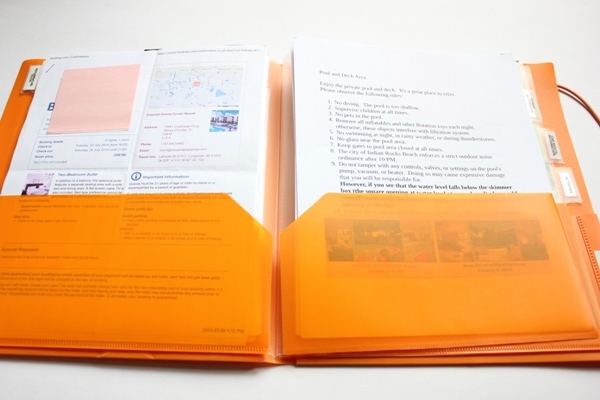 I print out flight itineraries, accommodation confirmation emails and anything other pertinent information that we need and then add these papers to the appropriate tab. When we travel we almost always use VRBO to book our accommodation through and there are usually condo instructions that I like to print out and keep handy so we don’t break any rules :). I will often add an envelope to the back to use for receipt collection as well. I just feel so much better having everything together and secure. My vacation portfolio stays in my carry on bag so I can easily access it whenever I need it. Or my family can but they usually leave everything up to me. The front of my portfolio allows me to slide in a cover page which for me is always a calendar for the time we are away. I just go online and print off a free one like these ones HERE. This is especially helpful if we are staying in multiple locations. For more fun travel information be sure to visit my organized travel and summer boards on Pinterest. 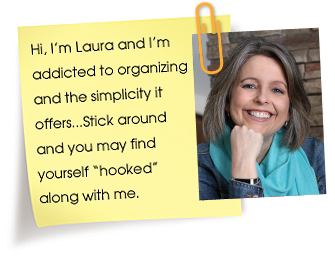 Follow Laura (Organizing Junkie)’s board Organized Summer on Pinterest. Oh and if you prefer to organize your vacation digitally, no problem. 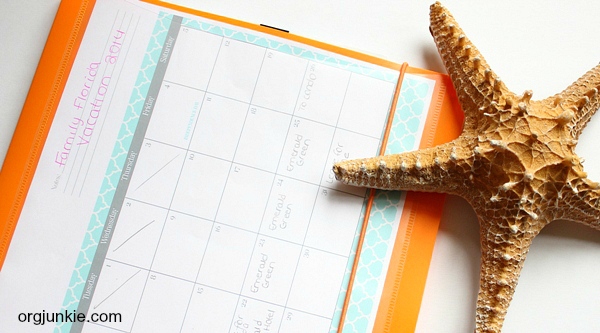 One of my contributors a few years ago shared how she uses Evernote to organize her vacation plans. In case anyone is interested here are a few posts I’ve done on the various places we’ve been. Thank you for yet another inspiring and useful post. We just got back from a family vacation to the Caribbean. It’s always fun once you get there, but the 24-hour travel time with several different types of transportation, little kids and somewhat unorganized travel companions calls for careful planning and good organization. I am definitely somewhere in the middle when it comes to having carbon or digital travel documents. I print out all of our tickets, visas, insurance papers, etc. and keep them in a nice binder in my carry-on, as you do. However, when it comes to our vacation plans, activities, Airbnb details, possible restaurants etc. (along with appropriate links) I like to have them nicely organized in a shared google calendar. This way everyone can access the information when needed and nothing gets lost. I also always have scanned copies of our passports on our OneDrive (cloud storage solution), so that we have those if anything were to happen with the originals. Love this idea! I’m just about to print out all of our vacation information for our trip to Hawaii. 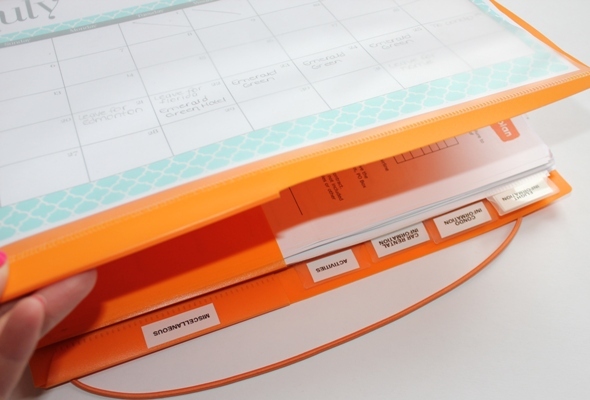 This will be a great way to organize it all. I just made my travel folder and feel oh so organized! It also makes me feel so much less stressed. So glad I found this idea. Thank you for sharing! You mentioned finding this folder at a Dollar Type store. Do you have a link for this item or remember which chain your purchased it in (Dollar Tree, Family Dollar, Dollar General, etc)?? It was Dollarama here in Canada. I will do a search on Amazon to see if I can find it. Will let you know if I do! I appreciate you looking…very sweet of you. A travel folder is what saved me during a long trip to many countries in Asia. But, It was jus a group of folders and I kept misplacing the one I needed. So I’m ready to buy the suggested folder today. I will be purchasing one for foreign travel and one for domestic travel. We are actually traveling more as empty nesters. I actually do use evernote for some organization and it is not blocked in China as many other programs are. I love your posts!